The sky at 7 a.m. this weekend from mid-northern latitudes. 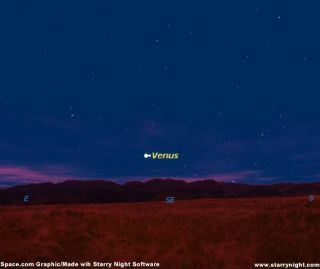 The planet Venus has returned to the early morning sky and has established itself as a dazzling morning lantern, emerging into view from beyond the east-southeast horizon before 5:00 a.m. local standard time. Just three weeks ago, on Jan. 13, was the day of its inferior conjunction - when it passed between the Sun and Earth and made its transition from an evening to a morning object. "I got up to answer the call of nature a little after 6 a.m. and looked out my southeast window to the approaching dawn. In the twilight, I spotted a bright object just a few degrees above the horizon. My guess was that it was Venus appearing on its eastward rise, which it turned out to be." And now Venus is much easier to sight, rising more than two hours before the Sun. Interestingly, for about the past week or so, I've been getting inquiries from those who arise early in the morning, en route to work and school, asking what is that "dazzling white star," which now precedes the rising Sun? Perhaps, they were standing at a bus stop or a train platform when their attention was drawn to Venus. Often, they will follow up with the comment, "Just a week ago, it wasn't there!" I suspect, I'll be getting an increasing number of such inquiries in the coming days ahead. On Friday, Feb. 17, Venus comes up in total darkness, about an hour before the first glimmer of dawn, while shining at its greatest brilliancy (magnitude -4.5). To give you an idea of just how radiant Venus will be at that time, it will appear to gleam 17 times brighter than Sirius, the brightest of all stars. In fact, it's so bright even now, that you might try sighting it on very clear days with the naked eye after sunrise. If you can keep track of where it is through sunup, you should still be able to see it as a tiny white "speck" against the blue daytime sky. As a bonus, a lovely crescent Moon slides well to the south and east of Venus on the mornings of Feb. 24 and 25. During March and April, Venus will appear to slowly lower a bit in altitude in the predawn sky, but then from late April through about the middle of August, it will appear to rise at approximately the same time as the beginning of morning twilight, roughly two hours before sunrise. So it pretty much will remain a fixture in our morning sky from now, right on through at least the middle of the summer. Now is also a fine time to examine the crescent of Venus in a telescope or even a pair of binoculars. A steady mounting for the binoculars - even just bracing them against the side of a tree - can make all the difference in the world. After he initially caught sight of Venus out his window, Mr. Bogardus checked it out with his 60-mm. refracting telescope, and found Venus to be "a very thin crescent, as thin as you might find in a two-day old moon." There are, in fact, some individuals with such acute vision who claim that they can actually see the crescent of Venus without any optical aid. If you'd like to test your own perception of vision on Venus, the best time to try it would be during bright twilight, say 15 to 30 minutes before sunrise. At that time, Venus will appear with far less glare against the background sky, giving your eyes a better opportunity to perceive its shape. Whenever Venus appears as a thin crescent, I often like to relate a very amusing story related by George Lovi (1939-1993) who was a well-known astronomy lecturer and author. One night, while running a public viewing night at the Brooklyn College Observatory in New York, the telescope was pointed right at Venus, then displaying its delicate crescent shape. Yet one student gazing through the telescope eyepiece stubbornly insisted he was really looking at the Moon. When Mr. Lovi commented that the Moon wasn't even in the sky, the student replied, "So what? Doesn't a telescope show you things you can't see without it?"